No boring formal posed photos for this bride. Well, we did a few to satisfy the desires of the bride and groom’s families, but this amazing couple was all about the fun. These are her bridesmaids, her "sistas", her BFFs; and she wanted to create fun pictures that captured and celebrated their bond...their true friendship. These girls rocked it! Their fun-loving, candid, casual personalities came through in all of their non-traditional wedding photographs. Which brings up another important consideration. Your wedding photographer should be fun, too. Just look at the pictures in my portfolio and you can see and feel the enjoyment my clients are experiencing when they spend the most important day of their lives with me. You’re going to spend more time with your wedding photographer than any other professional vendor that caters to you on your special day. 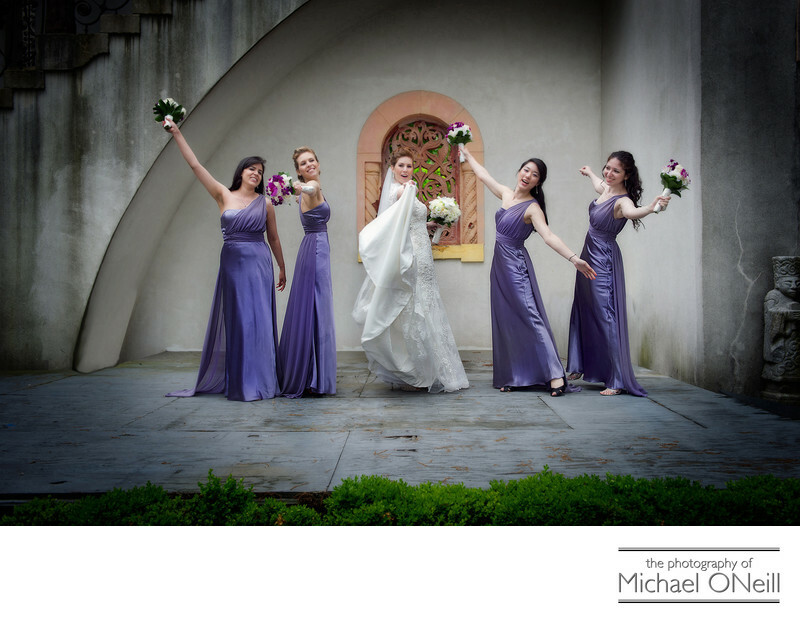 Be sure to pick one who is as excited about your big day as you are.This image was created at the Vanderbilt Museum and Planetarium in Centerport, NY in the town of Huntington on Long Island. This wonderful North Shore estate features sprawling lawns overlooking the waterfront of Northport Bay and beautifully manicured boxwood gardens. The cobblestone courtyard of the mansion is a photographer’s dream. Any time of day you can point your camera in nearly every direction and capture the beauty of this vintage Gold Coast estate.This venue is located less than ten minutes from my East Northport, New York photography studio and gallery and I take my bridal couples and their bridesmaids, ushers, groomsmen and families here all the time. Experience is critical and I have visited this location so many times that I’d swear I know more about the venue than the caretakers of the estate do. Keep perusing the pictures on my web site. You’ll soon see an awesome image that was captured inside the mansion itself. I hate to consider the possibility of bad weather on your wedding day, but if you do encounter it this photographer knows how to make the most of it. That is what being a true professional is all about. I would love to share my experience and creativity with you and, above all, have fun doing it.